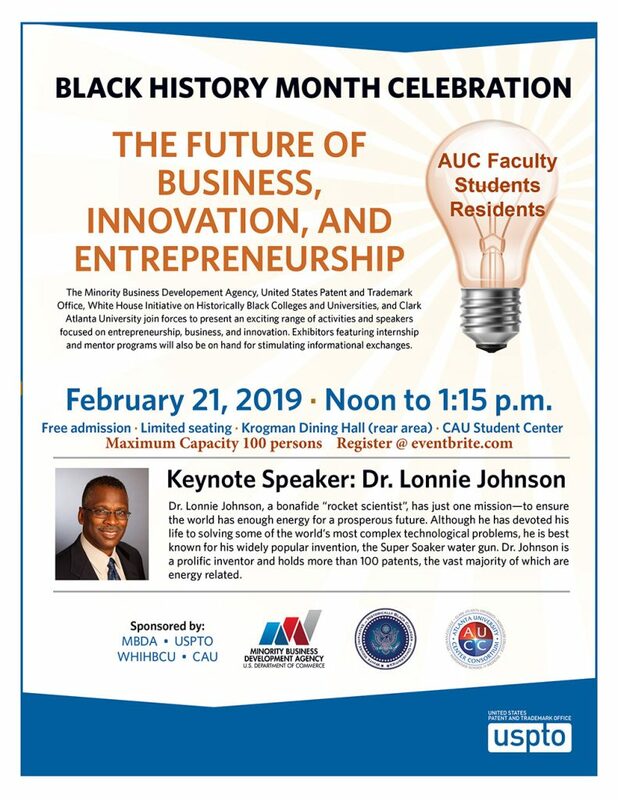 The Minority Business Development Association, Department of Education, US Patent and Trade organization, AUCC CommUniversity and CAU STEM Entrepreneurship Initiative join forces to present an exciting range of speakers focused on entrepreneurship, business, and innovation. Faculty and staff will also be on hand for stimulating informational exchange with students. Our featured speaker is Dr. Lonnie Johnson, a noted rocket scientist and prolific inventor who holds more than 100 patents of which he is best known for his “Super Soaker” water gun, and other energy related inventions. Dr. Johnson will speak on the Future of Business, Innovation and Entrepreneurship. Come join us for this Black History Month Celebration! Free admission and limited seating to the first 100 (max) AUC students, staff, faculty and residents. RSVP at Eventbrite.com or email Anthony Otey, AUCC Project Manager for Community Engagement at aotey@aucenter.edu to attend. Anthony B. Otey, M. Ed.